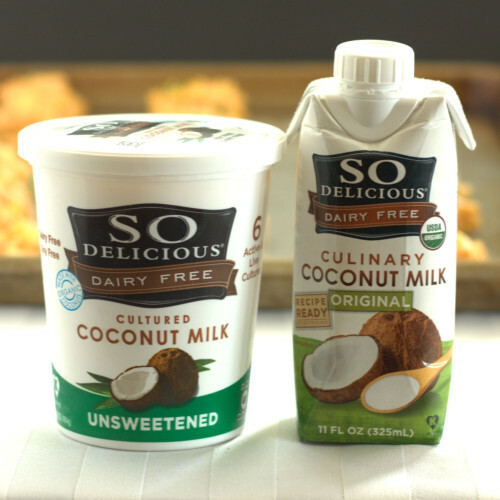 My family is in love with non-dairy milks, so when I heard about the So Delicious and Go Dairy Free Snackable Recipe Contest I was super excited for such a good excuse to try a wealth of other dairy free products. What most peaked my interest was the variety of coconut based offerings. I quickly nabbed the So Delicious original culinary coconut milk and So Delicious unsweetened cultured coconut milk. The culinary coconut milk is thick and creamy, whereas the cultured coconut milk is akin to sour cream, keeping the tang of sour cream and adding just a hint of coconut flavor. 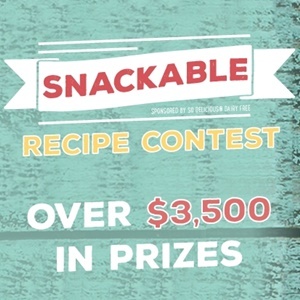 The contest poses the challenge of creating something sweet, something savory, or something sippable. Hmmm. 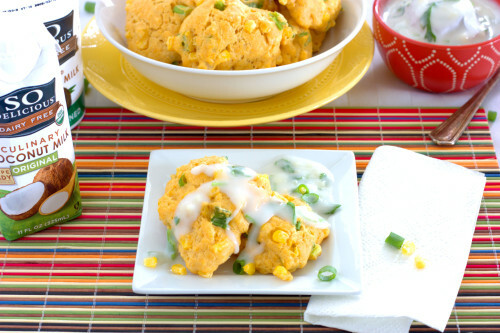 After swirling a few ideas around I landed on savory, deciding to go with Thai themed Curry Corn Fritters. In addition to the So Delicious culinary coconut milk, I have stirred in a bit of corn, green onion, and red curry paste to flavor the fritters. I kept it easy by using self-rising flour and by baking instead of frying the curry corn fritters (who wants to babysit a deep fryer during a party?). Yet, the fritters still seem like a luxurious treat when they get a dunk in the cilantro and garlic infused So Delicious cultured coconut milk. 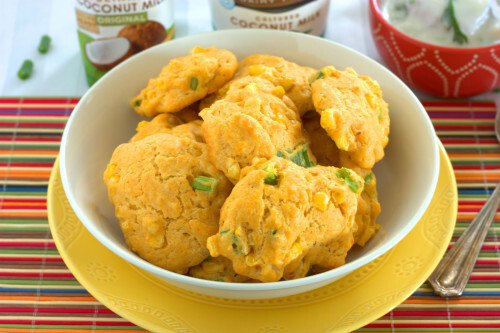 The corn fritters were a hit, which means I’m dreaming up even more uses for the other So Delicious dairy free products. Don’t mind me as a grab another Curry Corn Fritter while I ponder . . . .
Preheat oven to 400 °F. Coat large cookie sheet with non-stick spray. In a large bowl, stir together the coconut milk, egg, coconut oil, and red curry paste. 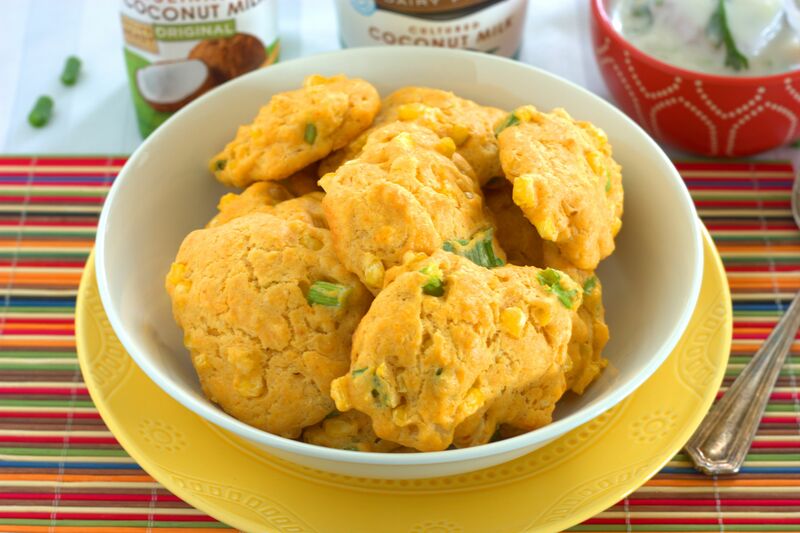 Mix together the flour and salt and then add to the coconut milk until dough sticks together. Stir in corn, and green onion. Drop dough by rounded tablespoonfuls, 1 inch apart onto the cookie sheet. While the fritters are baking, stir together the dipping sauce by mixing the cultured coconut milk, cilantro, garlic, and remaining salt. Bake 15-18 minutes or until puffed and golden. Serve warm with dipping sauce on the side. 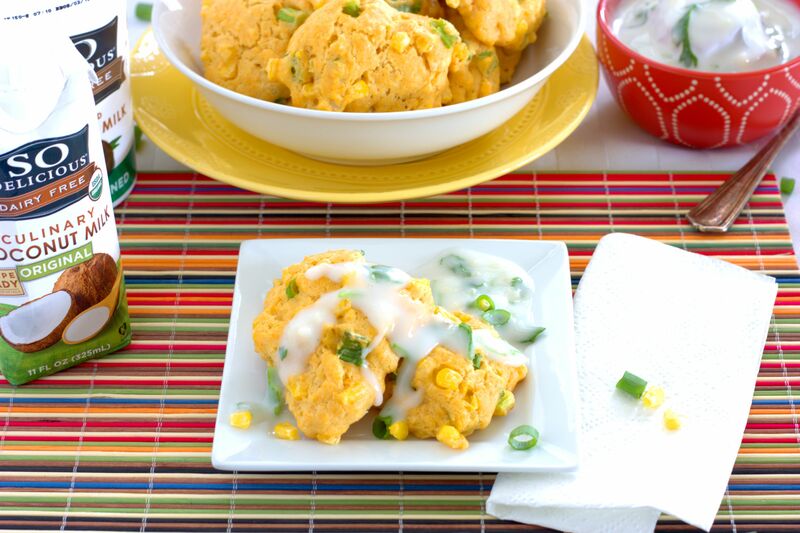 This entry was posted in Appetizer and tagged corn, garlic. Do you think there would be any difference using fresh corn? I am so addicted to it in the summertime when it’s local! This looks delicious…I love the flavor combination! You can’t beat the flavor of fresh corn! The substitution shouldn’t be a problem.